A cold morning reveals trees covered with a hoarfrost in Austria, Europe. One of the most beautiful valley in the European alps is the Pinzgau Valley. Near the little town of Neukirchen am Grossvenediger if you're willing to get up early on a very cold morning you have a chance to see these frozen trees. After exposure to sun they loose this white hoarfrost within minutes. 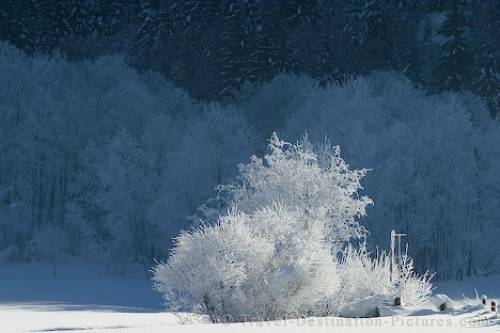 Picture trees covered with hoarfrost in the Pinzgau Valley, Austria, Europe.